Villa Corallina is a centrally located property within walking distance to the main Coral Bay Strip. Here you can find a good number of shops, bars and restaurants as well as Coral Bay Beach which is also a Blue Flag Beach. Another beach - the pleasant Corallia - is just a little over 10 minutes' walk away. The villa is spacious inside and out and has a private swimming pool - the perfect relaxing retreat. Air conditioning/heating in the bedrooms, pool heating and WiFi are included. Spaciousness throughout, a private swimming pool and just 15 minutes' walk to the main Strip of Coral Bay. Perfect! The private swimming pool takes centre stage and is surrounded by a tiled sunbathing terrace. You can enjoy alfresco dining on the covered part of the terrace housing a table and chairs, plus there is a brick BBQ. There are also games tables for everyone to enjoy. There is off road parking for your hire car and the front door leads to the living area. The open plan living area is bright and spacious. There is a comfortable seating area, a flat screen TV, a dining table and chairs, plus patio doors to the pool terrace. The well-equipped kitchen has another interior dining set and is equipped with all you need for preparing your holiday feast. There is also access to the side of the villa and a separate utility room. On the ground floor is a double bedroom and a separate shower room. Upstairs you'll find a double bedroom with a dressing room and an en suite bathroom and a twin bedroom with an en suite shower room, both sharing access to the balcony overlooking the pool area. There is also another twin bedroom with an en suite shower room and a small private balcony. All bedrooms are spacious and tastefully decorated. Located in a residential cul-de-sac, Villa Corallina stands in private grounds with the nearest restaurant being only 600 yards away. This house is just 15 minutes' walk to the main Strip where you can find a good number of shops, bars and eateries, plus the Blue Flag Beach of Coral Bay. The smaller beach of Corallia is just a little over 10 minutes' walk away and is great for topping up your tan. There is a mini market 900 yards away from the villa with more choice in the centre of Coral Bay. This is where you will also find leather and souvenir shops. If you're looking for something a bit different, Paphos Old Town is only about 20 minutes away by car or taxi. The old town has a partially covered farmers and retailers market. You can purchase all kinds of ware from oranges, fish and meat to lace, leather and therapeutic olive oil products. It's worth a visit on a Saturday morning when the locals are around if you like the hustle and bustle. There are many restaurants just a short walk away from the villa, which will suit all culinary tastes. Along the main strip of Coral Bay there are many bars and cafes where you can sit and have a refreshing drink while watching the world go by. A short drive along country roads takes you to the picturesque village of Peyia where more traditional tavernas await you. The Blue Flag Beach of Coral Bay is 15 minutes' walk from the villa and this is where you can take a dip in the Mediterranean Sea. The beach of Corallia is the closest one to the villa and also a great place to top up your holiday tan, a little over 10 minutes' walk away. Coral Bay is an ideal resort for the young, elderly and families with something for everyone. Ithaki Amusement Park and mini golf is an amusement park which includes arcade video games and a cafe bar. There is a play area for smaller children with swings and slides. Coral Bay Go-Karting is something to be experienced by all ages. There are many interesting places to visit in Cyprus. Why not to indulge in some history and visit the ancient burial site of Tombs of the Kings? Aphrodite's Baths, where the Goddess of love used to shower, are located in Latchi and is well worth a visit. Kato Paphos (the harbour) is home to some of the most intricate mosaics in the Eastern Mediterranean. Aphrodite Golf Course is just past the airport. Elea Golf Course is located just before the airport and Minthis Hills is in Tsada. Whilst on your Cyprus holiday, visit the Akamas Peninsular, which is the perfect place for a hiking trip. The view from the top is amazing! Villa Corallina is not available to book for season as it is sold out. 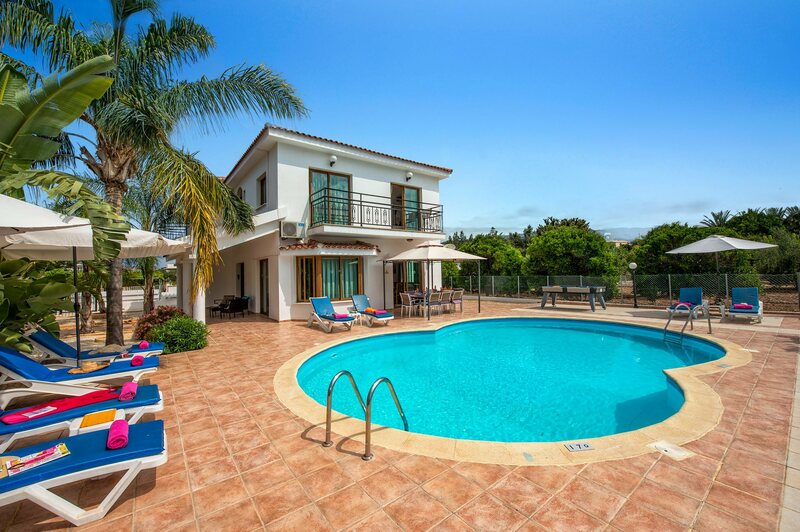 Take a look here at the Cyprus villas that are currently on sale. We were a party of 6 adults The Villa suited our needs very well, we all had a great relaxing time. Would use it again. We really enjoyed our stay at the villa, everyone was very helpful with any queries we had. The villa generally exceeded all expectations, especially the kitchen equipment - there was everything you could possibly need and more! Superb - will definitely be using Villa Plus again and will also recommend you to all of my friends. Organised, helpful and friendly - everything I could ask for when organising my holiday. The villa was exactly what was published on the website. A very nice villa in a fairly good location. The frog and toad pub down the road excellent, made us very welcome and a decent drink! Very enjoyable and relaxing holiday experience. Many thanks. Essentially everything was as expected and the holiday experience was very enjoyable, without any hitches. The quality of the fixtures and fittings in the villa were execellent, particularly the luxury bathrooms. The location of Villa Corallina was ideal for enjoying the facilities in Coral Bay - 5 minute drive or taxi journey. A 15 miniute drive or taxi journey took is into the centre of Paphos. Overall my wife and I rate the holiday experience with Villa Plus as excellent and will definitely visit the Villa Plus website when looking for our next holiday.